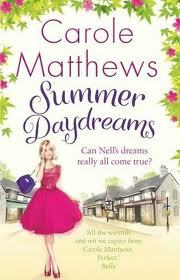 I am a huge fan of Carole Matthews and I have been eagerly awaiting her next novel. Since Carole has changed publishers her book covers have really changed and are really eye-catching and Summer Daydreams has a beautiful and bright cover which certainly suits the title. Nell McNamara works in the local fish and chips shop to try and bring more money in to help her struggling family keep their heads above water. Husband Olly is juggling work trying to make ends meet. Nell and Olly have a beautiful little girl called Petal who they have to try and juggle child care between their jobs. Nell wants a better life for her family and after an idea is put in her head by her chip shop boss Phil she decides to go into business on her own. As with the start of any business venture there sure are ups and downs but poor Nell does get more than her fair share of problems. This book had a very realistic storyline, with so many people struggling with the current economic climate people are trying to do whatever they can to try and bring more money in to take the strain off of the constant flow of bills they have to pay. It was great to see Nell take on a new challenge and to use her own skills to set up a business but it shows how difficult and also how important it is when having your own business to try and get the work and family balance right. I liked that although Nell is our main character in this book every so often the book switches to Olly’s point of view and we get to see firsthand how Nells new business has an effect on their relationship and also how it is effecting Petal. I loved little Petal in this book she really was a fun little character that brought a lot of humour to the storyline. I loved the friendly mix of characters in this book there didn’t feel as though there were and ulterior motives from any of the characters which made the book a joy to read it made the book a simple and enjoyable read without having to have your guard up trying to find out who was the bad guy! Once again Carole’s beautiful writing style had me gripped meaning I finished this book in a few hours. As ever she has created a great group of characters and a fresh new storyline that just keeps you turning the page. Carole Matthews strikes again!